Dashboard Hawaiian hula girl dancer is solar powered, so she hula dances in realistic hula motion in any bright UV light or sunlight. Solar dancing plastic hula girl features a painted bright Green bikini top and Green ''grass'' hula skirt. Miniature solar dashboard hula girl measures approx. 4-inch (10cm) tall x 2-inch (5cm) wide base. Once you hit the lights these hula girls spring into action! Just expose the solar strip to bright UV sun light, and watch as her hips and arms provide you with your own personal hula dance on demand. *Just add your own adhesive base (*adhesive NOT included) and she'll be perfect for any dashboard. Fun beach party favors, or display on table, desk top, fireplace mantle, window ledge… anywhere you need a touch of paradise! 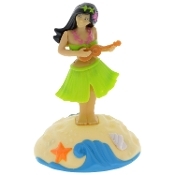 Celebrate the spirit of Aloha with our petite Solar Power Motion Hula Girl Toy. Just place this tropical island diva in the sun and she will dance the hula. Pour a fruity Tahitian drink, add a flowered lei around your neck, and go anywhere Hawaiian style with this cute solar powered toy! Solar Hula Girl is approx. 4-inch (10cm) tall x 2-inch (5cm) wide (at widest point) x 2.5-inch (6.25cm) deep, hard plastic with bright green and multi-color painted details.